Workshop, originally uploaded by Donyale..
Due to smashing my iphone on the day of set-up, I still have many photos to upload from the wonderful 3day Spin Fest, Art Yarn Workshop & Retreat held recently in the beautiful Blue Mountains. To kick off the 3day weekend, I had a most outstanding experience teaching many enthusiastic fibre-friends the art of dyeing wool with Greener Shades. We dyed some beautiful fibres every colour of the rainbow using low water immersion microwave method, and also squeezed in kettle dyeing. This left us only a short time to overview Drum carding basics and Felt Sushi beads were made & fondled with guest tutor Pam De Groot in the afternoon. We were totally geared up for what turned out to be a wild & wonderful weekend spinning, learning & sharing inspriation with Jacey. 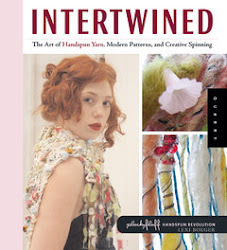 To top it all off, the weekend was spent spinning with 20 fabulous ladies all hyper to learn from international superstar spinster Jacey Boggs aka Insubordiknit.. a most informative & fun time indeed! Here are pix of (some) of the yarns I spun up during the weekend.. I am obviously in blogville today.. get ready for another post shortly!